Increasingly, those of us who might pursue an interest in photography, are doing so thanks to action cams. No strangers to having fun with the pint-sized powerhouses of photography, we know all too well that action cams, despite their rugged intent, need to be safe and protected as much as a full-sized DLSR. But whereas conventional camera bags are ten a penny, none of them have dedicated action cam storage... until now. 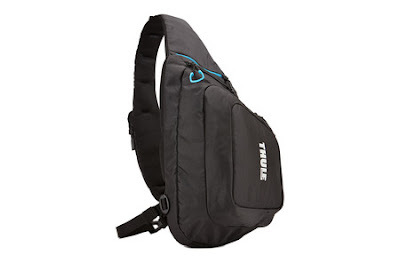 We pack up with the Thule Legend GoPro Sling Pack. 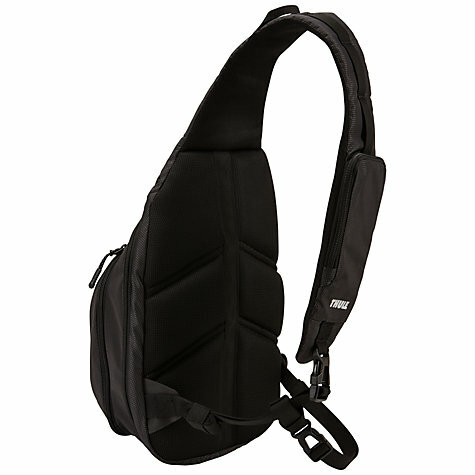 This is a medium sized shoulder bag designed to be easy to access and user friendly while out in the field. As the name suggests, it has been specially created to cater for a certain make of action cam, but straight off the starting line we need to say that we discovered it can successfully be used with other brands. But how does it keep you action cams safe? Well, in the main compartment you'll find a shock-absorbent foam tray with cut-outs into which you slot your cams. The Thule Legend GoPro Sling Pack can accommodate two such cameras, the mounting screws for each cam, as well as other mounts and grips that you'll typically need when recording action. As well as that main foam compartment, there is a mesh section ideal for SD cards and USB wires, a separate front pocket for other bits and bobs, a padded, nylex-lined pocket at the base of the strap for a smartphone, and a smaller pocket on the actual strap itself, designed to worn on your chest. 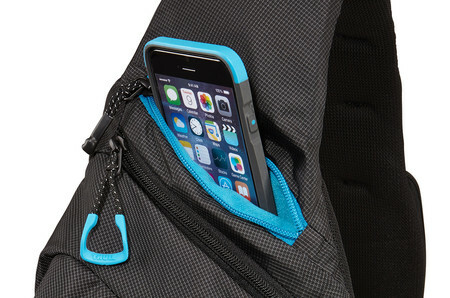 This pocket could also accommodate a phone, if you still keep your prized Nokia 3210 from 1999. All in all, a good quality bag, but if you think it all sounds a bit too specialised toward the action cam user market, fret not. That foam tray that keeps the cams safe can actually be pulled out and completely removed, leaving a decent sized compartment in the centre of the bag. That way you can use the Thule Legend GoPro Sling Pack as a normal day pack and still have room for all your everyday-carry gear, including a tablet. Like all good camera bags, you can access your kit without having to remove the pack. Just spin it over your shoulder, zip open the main compartment, and the cam tray folds down and hangs horizontally thanks to the sewn-in supports. That way you can whip it open, grab your cam and the mounts you need, then close it up and you're off. You can even attach the optional sternum strap to keep the bag in place - especially handy if you're cycling or doing anything exciting. Which of course you will be. You thrill-seeker, you. This is a great bag, even without the GoPro storage compartment. Those of us who actually use action cams on a regular basis will be happy to hear that a company like Thule are tackling the issue of keeping our cams safe, and doing so in a stylish and practical manner.